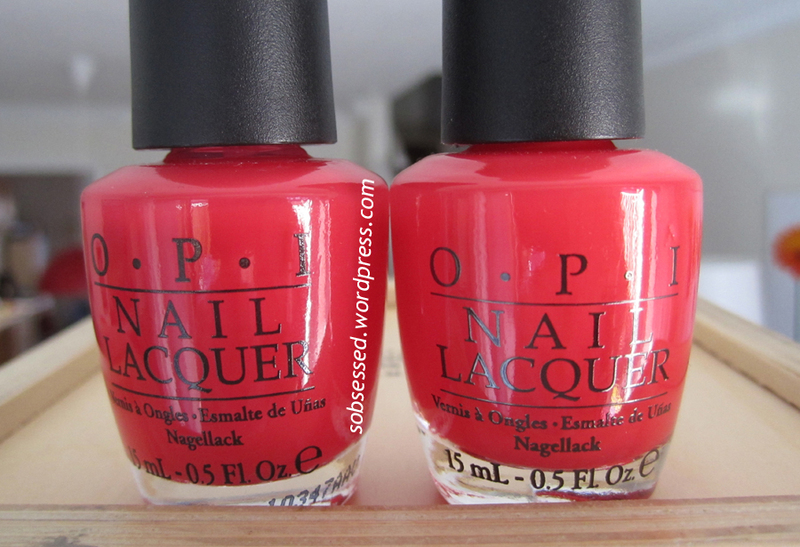 OPI Texas Sorbet/Jelly Roundup – Guest Post! Hi there! It’s time for another guest-post! Two in a row, I know, I’m on a roll!! 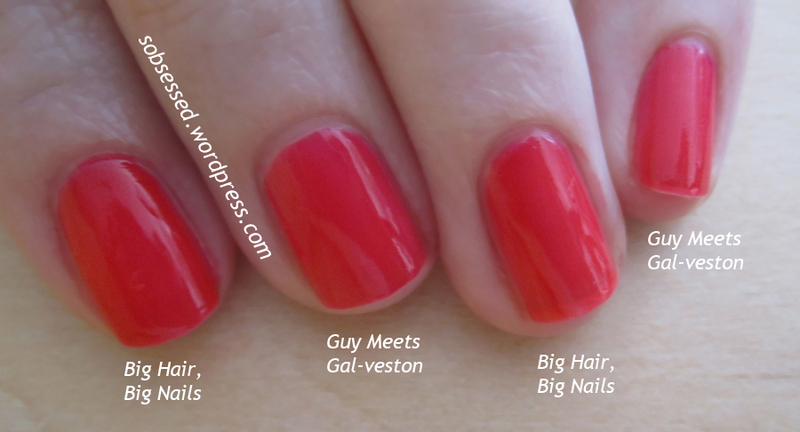 Today I have two polishes from the OPI Spring 2011 Texas Collection; Guy Meets Gal-veston and Big Hair, Big Nails, which ended up being a comparison post because I actually thought I had a mislabeled bottle or something, but more on that later. I searched out Guy Meets Gal-veston mainly due to its perfect happy coral colour and the promise of my beloved jelly finish. Which OPI has rebranded as a sorbet, but I’ll take it either way, jelly, sorbet, whatever. Here I have on one coat of OPI basecoat, 3 thin coats of Guy Meets Gal-veston and one coat of Essie Good To Go topcoat. All photos are taken in either direct or indirect natural lighting. It was a beautiful afternoon today! You can really see the shine and delicious squishy jelly finish in the photo below. Guy Meets Gal-veston really is a perfect pinky-coral that was a breeze to apply. Really very easy application, with such a glossy finish even without the added topcoat. I think this picture really captures the true colour on the nail. My dear friend, The Obsessed was grabbing a few polishes the other week and asked if I wanted anything. I had just received my Guy Meets Gal-veston, and I asked her to pick up the only other colour from the Texas Collection that I could remember off the top of my head, Big Hair, Big Nails. Ok, so Guy Meets Gal-veston is on the left and Big Hair, Big Nails is on the right. Onto my nails… can you see a difference now? Crazy!! They really do look like the exact same shade. The only fingers that look remotely different are my index and middle fingers, and I wonder if I was just heavy-handed with my application on one of them or something. There is ever so slightly a difference between the two polishes, Guy Meets Gal-veston looks ever so slightly more berry toned than Big Hair, Big Nails which has a hint more red in it, but WOW are these ever similar. I have to wonder what OPI was thinking releasing almost perfect dupes in the same collection. In the end, I’m in LOVE with both of these polishes; the sorbet finish, the pro-wide brush, the ease of application and the incredible shine. Do I need both colours? Definitely not, but I really can’t resist a sorbet/jelly so I’m (ahem) keeping both bottles.